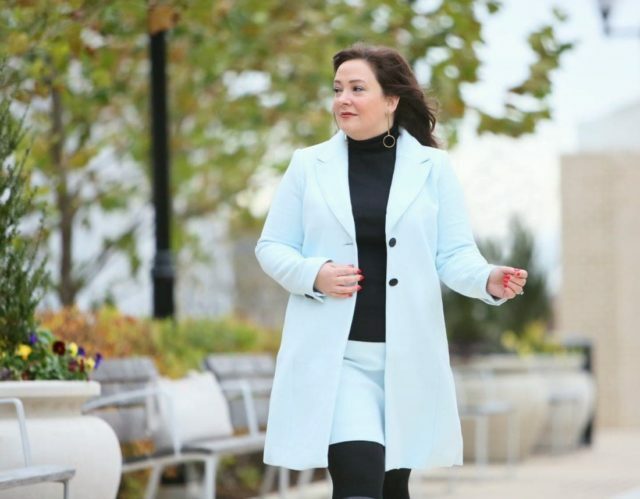 The weather outside is frightful, but this cozy skirt suit is so delightful. Sometimes you have to decide between warmth and professionalism in winter, but I learned a few tricks being a DC corporate commuter. 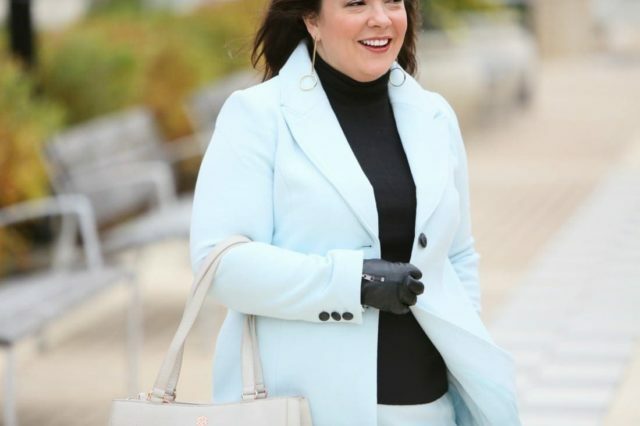 Fleece tights, tall boots, slips, Lands' End Thermaskin layers, and suiting like this ice blue skirt suit from White House Black Market. The skirt and jacket are from what feels almost like flannel, thick and plush and fully lined. 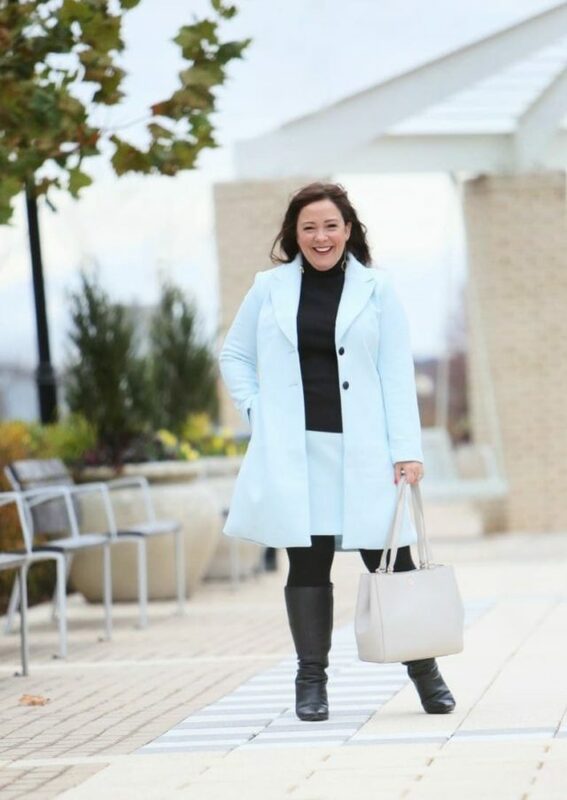 This long jacket could double as a lightweight coat in fall and spring. The ice blue is a nice change from autumnal shades of red, orange, and brown. 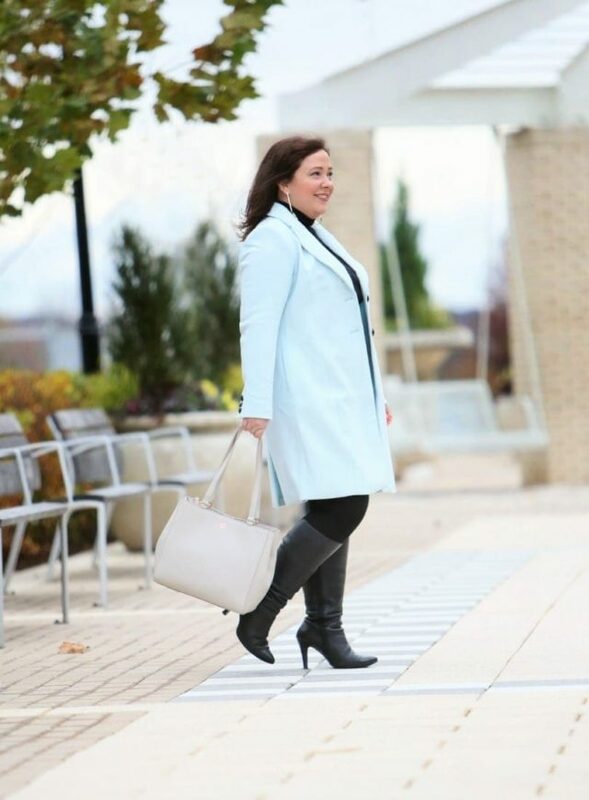 Pairing a pastel with black makes it feel right for the season. FYI if you're considering this suit, I find the skirt runs big. I wish I ordered a 12 petite instead. I specifically chose this suit because it comes in regular, petite, and plus sizes. White House Black Market carries plus sized clothing up to a 3X/24 though not all of their collection is available in the complete size range. 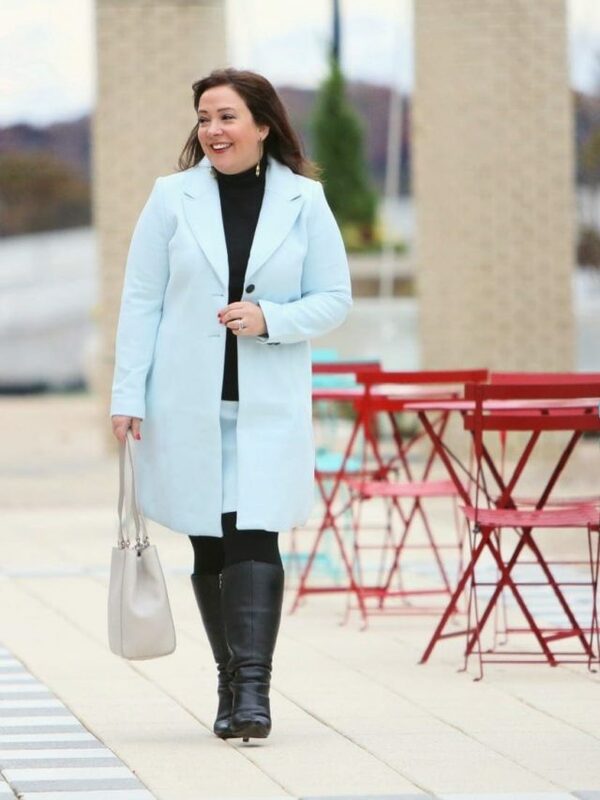 However, they are a great resource for plus sized suiting and work fashion. The tight are from Hipstik; they reached out and asked if I'd like to try their incredibly comfortable tights. I was game, as I hate tights. They give me muffin top, they sag, they bag at the knees and ankles because I'm short but curvy and tights to fit my belly are made for a 6'2″ woman. These have a lace top instead of a traditional waistband. On me they go all the way up to my ribcage, but they don't slide thanks to silicone grips in the lace. No squeezing, no sagging, no crotch an inch away from my body, no toes losing circulation, and no baggy knees and ankles. They're thick; not quite fleece tight thick but thicker than any other opaque tights in my collection. And they are incredibly comfortable. I came home after a long day and took off the jacket but left on the tights until I went to bed they were so comfy. I've also washed them (gentle cycle, lingerie bag, line dry) and they came out same size, same shape. Color me impressed! And this is the new smaller size of the Allyn Tote from Dagne Dover. 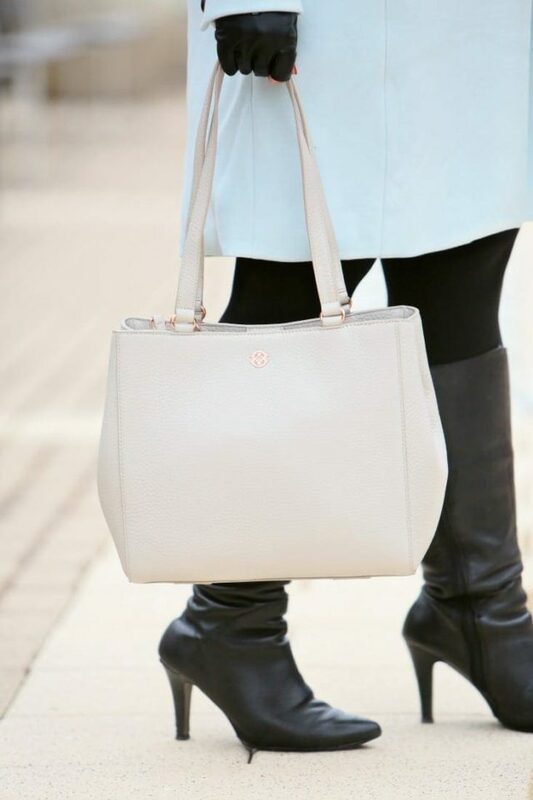 Here is my initial Dagne Dover Allyn Tote review, it continues to be a fave in my collection. The smaller size is just as smartly designed, but on a smaller scale making it more comfortable for everyday. I love the oyster color, it's such an elegant neutral! Beautifully simple outfit. Channels the easy elegance of the Duchess of Cambridge. And the colour is lovely on you. Bumping around on Amazon tonight. Saw a woman named Jo Weldon has written a book called “Fierce: The History of Leopard Print.” Of course I immediately thought of you. If you haven’t seen it, you might want to take a look. The author is Headmistress of a burlesque school. You look great– very mod– kind of “that girl” 🙂 ! Would you wear the coat indoors, or is it more for the commute? Stunning Look! Love the color and the lines of the jacket & skirt! Simply Amazing! Do you find that the tights correlate to your pant size? I was confused by the sizing. I went with a size E since I am an oval and it was that size on the chart. Also I wear a 12/14. They fit but far looser than most tights, I wonder if I could have sized down. I usually size up with tights because they’re usually too tight on my belly but think if I ordered again I’d try a D just to see. But it may be just because they’re so drastically different from other tights. They weren’t sagging, they just weren’t like a second skin. The feeling was more similar to fleece tights but not as thick and far more stretchy. This looks stunning on you! Normally I’m not into black and pastels, but this is wow.